Chad Barrett questioned if he would play first-class cricket again before his century on his Championship debut for Northants against Worcestershire. The 27-year-old came in at number 10 and finished 114 not out at New Road. 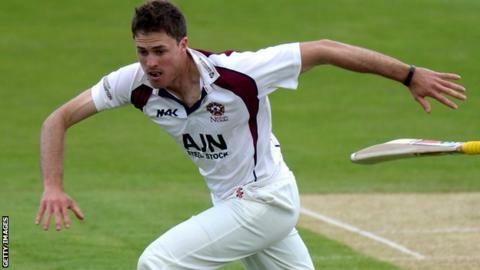 The South African's only previous first-class experience came in 2014 for Northants against the Sri Lankans. "Two years waiting to play a second first-class game is a long time and you think to yourself 'are you going to play another one?'" he said. "When I got the nod, I thought when I have a bat or a bowl I've just got to show what I can do." Barrett has played for a number of county Second XIs trying to earn another first-class chance, including Leicestershire, Middlesex and Somerset. But his opportunity has come at Northants, and his innings was the highest score by a number 10 for the county in first-class cricket. He told BBC Radio Northampton: "I'm a coach on the side and I've got very supportive parents, especially my mum, who kept on telling me 'keep going, you're good enough to be playing'. "It's tough to go round and play seconds cricket, but that's the life of a professional sportsman, you've got to go round and prove yourself. To finally get a gig here is a big plus."